This article will guide users on how to set up the account for voicemails to prevent voicemails from going through AT&T Office@Hand and have these messages go to the personal phone’s voicemail. There are cases when users prefer to use their own voicemail system. Office@Hand Users can set their extension to forward calls to a non­Office@Hand number, and have that forwarding number take the voice message. When the nonOffice@Hand number takes the voice message, the voicemail is stored in that number’s mailbox provided by its carrier, which is an advantage if the User has limited access to the Internet. IMPORTANT: Since the steps below aims to bypass Office@Hand’s mailbox, the voicemail storage is dependent on how the forwarding number is set up. If the forwarding number only allows to save up to 10 voice messages, the succeeding callers will most likely hear the message saying “mailbox is full”. If the forwarding number does not have a voicemail setup, the callers will not be able to leave a message. For account Administrators configuring for another User, Log in to your Office@Hand account then go to Users > Users list > Users With Extensions > select the name of the User, then select the applicable scenario from the table below. For Users configuring their own settings, Log in to your Office@Hand account, click Settings, then select the applicable scenario from the table below. For all scenarios, callers will hear the personal phone’s voicemail greeting and voicemail messages are saved in the personal phone’s mailbox. Callers hear Office@Hand’s ring back tone and hold music. Callers hear the personal phone’s ring back tone and hold music. Under User Hours, configure how you want Office@Hand to handle your incoming calls. 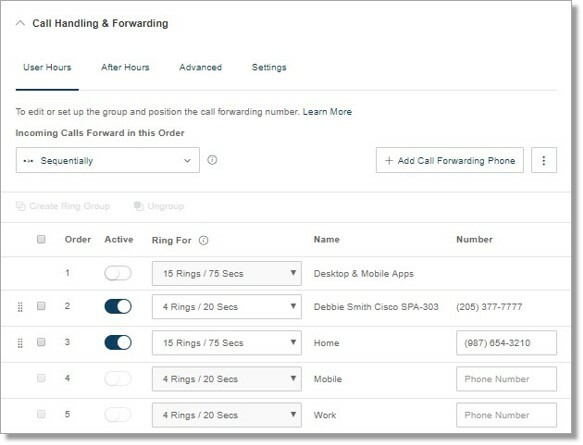 If incoming calls will be offered to multiple forwarding numbers, you can choose how the calls are offered to the forwarding numbers. Forwarding numbers can ring Simultaneously or Sequentially (one at a time). By default, your Office@Hand Desktop & Mobile Apps will always be the to first ring even when you select simultaneous ringing. If you want your calls to be forwarded straight to your desk phones and other forwarding numbers, you can disable Desktop & Mobile Apps from the forwarding numbers list by turning the Active Switch off (Gray switch means the forwarding number is disabled). There are 3 pre­labelled forwarding number slots for your non­Office@Hand phone numbers (Home, Mobile and Work). Enter the number where you want to save your voicemail messages on one of these pre­labelled slots, turn the Active switch on (Blue switch means the forwarding number is enabled), and then set the number of rings to maximum: 15 rings / 75 secs. If you have 2 or more forwarding numbers, and the phones are set to ring Sequentially (in the order specified), the forwarding number you chose to save your voice messages should be the last to ring and should be set to ring 15 times (75 secs). If you have 2 or more forwarding numbers, and the phones are set to ring Simultaneously (all at the same time), the forwarding number you chose to save your voice messages should have the maximum number of rings (75 secs), while the rest of the forwarding numbers should be kept at minimum. The number of rings set on the forwarding number should be greater than the number of rings it requires before it takes the voice message. This is to make sure that the forwarding number’s mailbox will pick up the call before the number of rings on Office@Hand runs out. Example: If your phone is supposed to ring 4 times before it takes the voicemail, then the number of rings on Office@Hand should be set to 25 seconds or higher. This is assuming that 1 ring is approximately equivalent to 5 seconds. You can save your voice messages in 1 location at a time. You need to choose where to save your voice messages; in your Office@Hand extension’s mailbox, or your personal device (landline / mobile phone). In the example below, Debbie’s Cisco phone will ring 4 times before the call is forwarded to the Home number (set to ring 15 times). Under the Call Handling & Fowarding section, click Settings tab. Under Incoming Call Information, click Edit. Select the Play Announcement tab. Set the Play announcement before connecting for Direct Calls to Never, and then click Save. This is an important step because Office@Hand by default plays an announcement when a call is forwarded to your non­-Office@Hand numbers then prompts you to press 1 to accept the call. If Play announcement before connecting is not set to Never, the caller is routed to the extension user’s Office@Hand voice mailbox. Go to the Advanced tab, and then click on the Add Rule button. Enter a descriptive name for the rule you are creating on the box provided, and then click Next. Select the appropriate condition when this rule will be applied, and then click Next. Caller ID ­ applies to calls coming from specific phone numbers. Called Number ­ rule is based on the phone number the caller dialed. Date and/or Time ­ rule is applied based on a time of the day and week every week, or on a specific date range. 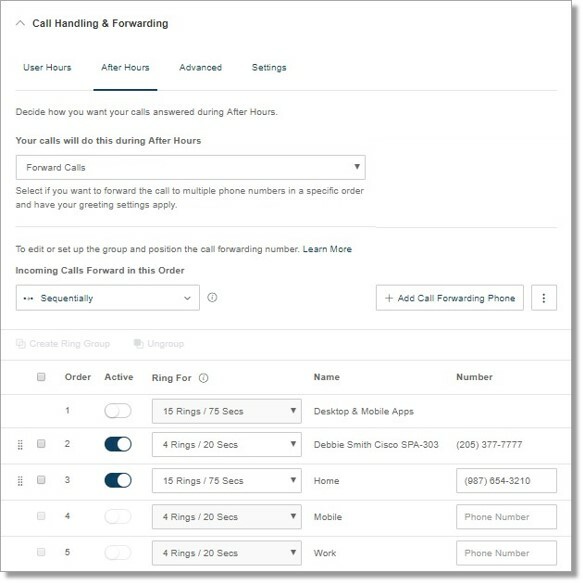 Under Define Call Handling, select the action to take when incoming calls match the rule. Select Unconditional Forwarding, enter the number where voicemail messages are going to be saved, and then click Save. Before you proceed, make sure to set your extension’s hours of operation. Go to the After Hours tab. Under Your calls will do this during After Hours, select Forward Calls. Under After Hours, configure how you want Office@Hand to handle your incoming calls. If incoming calls will be offered to multiple forwarding numbers, you can choose how the calls are offered to the forwarding numbers. Forwarding numbers can ring Simultaneously or Sequentially (one at a time). There are 3 pre-labeled forwarding number slots for your non­Office@Hand phone numbers (Home, Mobile and Work). Enter the number where you want to save your voicemail messages on one of these pre­-labeled slots, turn the Active switch on (Blue switch means the forwarding number is enabled), and then set the number of rings to maximum: 15 rings / 75 secs. Set the Play announcement before connecting for Direct Calls to Never, and then click Save. This is an important step because Office@Hand by default plays an announcement when a call is forwarded to your non­Office@Hand numbers then prompts you to press 1 to accept the call. If Play announcement before connecting is not set to Never, the caller is routed to the extension user’s Office@Hand voice mailbox. It is also important to note that this setting applies to User Hours and After Hours. Under Your calls will do this during After Hours, select Unconditional Forwarding. On the box provided under Forward Calls, enter the number where voicemail messages are going to be saved, and then click Save.